Brazil's President Michel Temer, left, delivers his country's ratification instrument to United Nations Secretary General Ban Ki-moon. Jason DeCrow AP/Press Association Images. All rights reserved. In his first address to the UN General Assembly, in September 2003, Brazilian President Luiz Inácio Lula da Silva described the eradication of hunger as ‘a civilisational challenge’, making clear to his peers that, while it was to be a domestic priority for his Workers’ Party (PT) government, it was also an international ‘moral and political imperative’. Now the subject of contested corruption charges, Lula left office at the end of 2010 with an unprecedented approval rating of 83 per cent. Among the main sources of popular satisfaction were his success in reducing hunger among poor Brazilians and his expansion of Brazilian influence abroad. The Department for Humanitarian Cooperation and Combat Against Hunger (CGFome) was established in 2004 to straddle these two fields of policy. Drawing on the Brazilian experience, CGFome has exported tested methodologies and technical expertise in hunger reduction, positioning Brazil as a world leader in food security and nutrition. Over the last 12 years, it has played an important substantive and symbolic role in the development of a foreign policy aimed at projecting Brazilian power while promoting sovereignty, multilateralism, and solidarity. On 13 September, the new Brazilian government closed CGFome – a move indicative of a shift in strategic priorities that will be of consequence for Brazil’s role in the world, as well as for international development cooperation and South-South relations. The Western press has not published a word on the matter. In 2013, sat in an oversized conference room, in a soulless hotel, in Istanbul’s pulseless business district, I listened, with warm admiration, as Milton Rondó Filho, the minister who had directed CGFome since its inception, addressed a small multinational assortment of policy wonks and humanitarian diplomats. With a professorial authority softened by an outlier’s humility, he posed challenging questions about the role of humanitarian action and discussed ‘the Brazilian approach’. Eschewing managerial and paternalistic development-speak, he talked of ‘cooperation, not assistance’ and ‘partners, not donors’: locutions that, while refreshing, might have communicated fanciful liberal idealism or, worse, duplicitous spin, were it not for the fact that the Brazilian Foreign Ministry (Itamaraty) had spent the previous decade pursuing strategic advantages precisely through its emphasis on horizontal, particularly regional and South-South, interstate relations, and through its efforts to democratise multilateral institutions. In its firm approach to WTO negotiations and its leadership in the G20+ trading bloc; in its turn towards the new markets of the developing world (during the eight years of Lula’s government alone, the proportion of Brazilian exports going to non-OECD countries increased from 38.5 per cent to 57 per cent); in its active participation in the G20 of major economies; in its campaign for UN Security Council reform; in its negotiations on Iran’s nuclear programme, leading to the 2010 Tehran Declaration with Turkey and Iran; and in strengthening its association with the BRICS group, including through the creation of the New Development Bank, Brazil has, over more than 13 years of PT government, become a central player in international relations by engaging with, and protecting the interests of, developing countries. It has massively strengthened its diplomatic and economic ties with Africa, and has developed a wide-ranging portfolio of technical exchange programmes with Lusophone African countries. It has prioritised Latin American integration, particularly through its engagement with the sub-regional bloc Mercosur. It has increased its participation in UN peacekeeping missions in developing countries. And, through the work of CGFome, it has taken on an increasingly prominent role in promoting food security in developing countries, providing emergency relief, supporting rural development, and strengthening social protection systems (spheres of activity that it has sought to link). ‘Ours is the country of Paulo Freire’, said Minister Rondó, in reference to the influential Brazilian pedagogue, ‘and we believe that development comes primarily from within’. He explained that, for Brazil, emergency humanitarian responses must always be imagined as contributing to processes of structural change, under the institutional banners of sustainability and human rights. This ‘structural perspective’, grounded in experience of bridging theory and practice, and of engaging productively with civil society, had been, he suggested, one of CGFome’s most important contributions to humanitarian discourse. But alongside discursive contributions, his department has also made a notable contribution to humanitarian practice. Between 2006 and 2015, it supported 682 programmes (emergency relief and long-term development) across more than a hundred countries. It has coordinated the Brazilian government’s growing financial contributions to numerous international organisations, primarily for food security programmes: by 2010, Brazil was the tenth largest donor to the World Food Programme (WFP), the sixth largest donor to the UN Office for Disaster Risk Reduction, and among the largest developing country donors to the World Bank’s Global Platform for Disaster Risk Reduction, the Office of the UN High Commissioner for Refugees, and the UN’s Central Emergency Response Fund. CGFome has led Brazil’s engagement in the innovative Purchase from Africans for Africa initiative, which, across five African countries, promotes access to food through school feeding and support for family farming, and is inspired by Brazil’s own Food Purchase Programme. CGFome was responsible for Brazil’s leadership in the widely praised 2009 reform of the Committee on Food Security of the UN Food and Agricultural Organisation (FAO). It played a key role in ensuring FAO’s adoption of the Right to Food Guidelines, in 2004, and the Voluntary Guidelines on the Responsible Governance of Tenure of Land, Fisheries and Forests in the Context of National Food Security, in 2012. It was actively involved in the development of the Sendai Framework for Disaster Risk Reduction. And it jointly led the Nutrition for Growth initiative. As the Brazilian government has exercised greater influence over international development cooperation in recent years, it has inevitably been subject to occasional criticism: for providing a large proportion of food aid in kind, exported from Brazil, even though the local purchase of food is first among the four stated principles of Brazilian support for humanitarian action; for continued defence of biofuel production, despite the potential inflationary impact on food prices (the idea that Brazilian sugar-based ethanol production has inflated food prices has been largely rebuffed); for prioritising humanitarian cooperation with countries of strategic importance (Brazil is hardly the black sheep among donor countries in this regard). But criticisms have been far outweighed by praise for Brazil’s innovation and leadership in promotion of food security. With Brazil’s success in reducing hunger at home (in 2009, ActionAid placed it first among developing countries in the HungerFREE scorecard; in 2011, WFP called it a ‘world champion in the fight against hunger’; in 2014, FAO recognised it, along with 12 other countries, for outstanding achievement in the fight against hunger), CGFome has been a credible and effective advocate and partner abroad. On 31 August, Dilma Rousseff, Lula’s successor, was impeached by the Brazilian Senate, bringing an end to PT rule and handing the presidency to Michel Temer of the Brazilian Democratic Movement Party (PMDB), who served as vice president under Dilma. With the fight against hunger centre stage during the years of PT government, the closure of CGFome in the first two weeks of the new administration comes across as a symbolic act of political partisanship. José Serra, who has been foreign minister since Dilma was initially suspended in April, has accused the PT of having pursued an ideological foreign policy based on ‘global populism’. Serra’s alternative course seems set to transform Brazilian foreign policy into a vehicle for the expansion of private enterprise. As the Brazilian government has exercised greater influence over international development cooperation in recent years, it has inevitably been subject to occasional criticism. One of Lula’s favourite boasts is that he turned Brazil from a net debtor into a net creditor, with macroeconomic policies that satisfied big business and finance capital, while still allowing for social spending to reduce extreme poverty. Indeed, a steadily growing economy was key to Brazil’s success in fighting hunger at home and abroad. But having shrunk for a sixth consecutive quarter, the Brazilian economy is currently facing its worst recession on record. A fiscal contraction, initiated by Dilma in 2013 and now proudly accelerated by Temer, has already affected social programmes (in September alone, 600,000 families have been cut from the Bolsa Família, the PT government’s flagship conditional cash transfer scheme) and overseas aid (Brazil’s annual food aid contributions have fallen by more than 90 per cent since the 2012 high of US$83m). However, the closure of CGFome shows that, rather than prescribing a time-bound dose of austerity, the new government is quickly getting on with the permanent restructuring of the state, as outlined in Temer’s plan for government: ‘A Bridge to the Future’. Under the responsibility of the newly created Programme for Investment Partnerships, Temer has planned mass privatisations, suggesting that, in terms of infrastructure, he will hand over ‘as much as possible’ to the private sector. With planned liberalisation of trade and capital flows, Serra has then promised that Itamaraty’s priority will be commercial relations with traditional partners such as the US, Europe, and Japan, with the aim of attracting foreign investment. Beyond efforts to access new markets for Brazilian exports, South-South and regional cooperation seems likely to take a backseat. In a recent video interview, Serra comically struggled to even name the other countries that make up the BRICS. Despite his professed desire to strengthen Mercosur, particularly its role in promoting free trade across the South American continent, he has ordered the removal of the Mercosur flag from in front of the Itamaraty building in Brasilia. He is also reshaping Brazilian diplomatic relations in the region: in June, he proposed the creation of a humanitarian corridor into Venezuela, in stark divergence from the PT government’s fervent defence of national sovereignty in the region. Meanwhile, Temer recently cancelled Dilma’s donation of three Brazilian T-27 Tucano planes to Mozambique, stating that they could instead be sold. By turning away from South-South cooperation and the kind of solidarity that characterised the PT government’s foreign policy, the Temer administration is also abandoning the protagonism through which Brazil has helped to reshape international relations and global governance in favour of the developing world. In rejection of a geostrategy based on the exercise of soft power in multilateral institutions, it is opting for a passive role, subject to the demands of foreign capital and the states that subsidise it. As Brazil recedes from its incipient leadership on humanitarian cooperation and food security, those living in poverty, affected by hunger, conflict, and disaster, who have received support from CGFome, are losing a powerful advocate and benefactor. Reduced engagement with other developing countries, meanwhile, is likely to slow the trend towards South-South cooperation, of which Brazil has been one of the foremost proponents. In recent years, there has been much discussion of the role of so-called ‘non-traditional donors’ in reshaping humanitarian governance and practice. But with the likely disengagement of Brazil, the preoccupation of the Russian and Turkish governments with conflict in the Middle East and with ongoing internal power struggles, and the downturn in China’s economy, enthusiasts for a multipolar global order will, perhaps predictably, have to put their celebrations on hold. 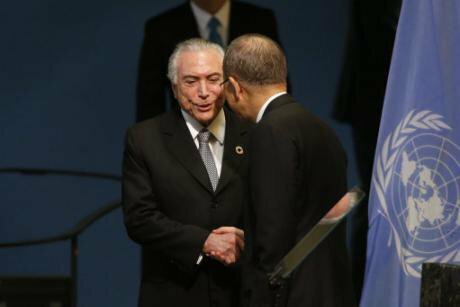 By turning away from South-South cooperation and the kind of solidarity that characterised the PT government’s foreign policy, the Temer administration is also abandoning the protagonism through which Brazil has helped to reshape international relations. The closure of CGFome is also, it appears, somewhat of a personal vendetta. In March, Minister Rondó sent to Brazilian embassies and diplomatic missions around the world messages from unions, social movements, and NGOs, stating that Dilma’s impeachment process was the pretext for a parliamentary coup, and requesting engagement with civil society organisations to raise awareness of the threat to Brazilian democracy. In June, once the interim government was in office, he was dismissed from his role as Coordinator-General of CGFome. With the new government now firmly installed, the career diplomat, responsible for guiding Brazil’s rise as a development partner, sits, waiting to be assigned a new role within Itamaraty, a spectator to the dismantlement of the department he founded, the dispersal of his staff, and the end of more than a decade of innovative, independent, and tenacious Brazilian foreign policy.